Elusive Victory is a standalone game that utilizes the Downtown game system to cover the three major conflicts that occurred in the Middle East during the period of 1967-1973. 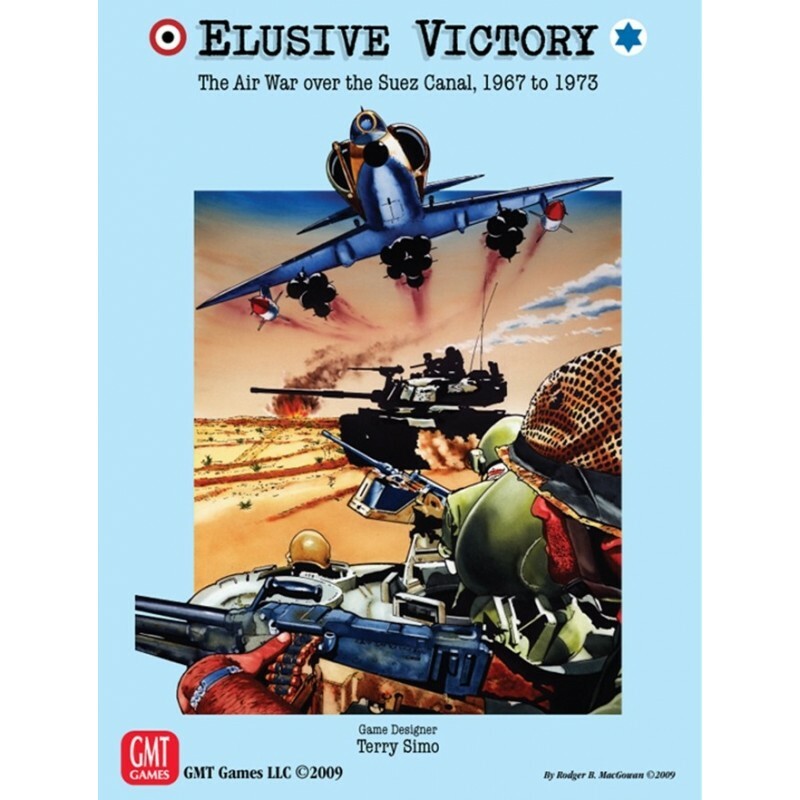 The game covers the Israeli surprise attack on Egypt and the Sinai during the Six Day War (1967) and the long War of Attrition (1967-1970) where each side used air power to assert their political will. The game culminates with the Egyptian offensive of the October War (aka "Ramadan War" or "Yom Kippur War") (1973). Elusive Victory recreates entire air raids in detail. The Israeli (IAF) player will have a wide assortment of French and United States aircraft at their command. They will also be able to defend their gained territory with HAWK SAM units and AAA. They will have to plan both offensive surprise attacks to neutralize the enemy and also defensive counter air (DCA) missions to defend territory gained. Additional mission types include suppression of enemy air defenses (SEAD), reconnaissance (RECCE) and close air support (CAS) of troops in contact with the enemy. The IAF player will have 13 different aircraft types to utilize during these missions ranging from the famous Mirage IIICJ, Super Mystere and Nesher to the workhorse A-4 and F-4. The Egyptian (EAF) player will have 12 different aircraft types and a wide assortment of Soviet weaponry to both defend and attack the Israelis. The EAF player has a tough nut to crack in fighting against the qualitatively superior IAF forces but the savvy player will find that the EAF is not helpless with an air defense array that is more deadly than the one the United States fought in Vietnam. The EAF player will have SA-2, SA-3 and mobile SA-6 SAM systems at their command. Aircraft types range from the standard MiG-17, MiG-19 and MiG-21 forming the backbone of their fighter arsenal but new types such as the IL-28, Su-7, Hawker Hunter and Mirage V gives them additional striking power. The EAF player also gets to introduce into combat the AS-5 air launched cruise missile to attack Israeli installations in the Sinai. Victory in the desert may always be within your reach but in the end will it be an Elusive Victory. Jeu très original et très détaillé décrivant parfaitement les opérations aériennes à l'échelle opérative.Le système est assez lourd cependant, il demande beaucoup d'investissement.